I have only ever finished knitting three shawls, but I have started many! I’ve learned a thing or two about what types of projects I’ll enjoy all the way through, what colors will keep me going, and what shape I’ll actually enjoy wearing once it’s done. Jess wants a pretty but fairly easy to knit shawl. I know that she’s managed to knit a pair of socks and a huge sweater coat, but she still feels a bit uneasy with increasing and decreasing. (At least she did the last time we talked about it—which was a while ago.) I am thinking about simple, repetitive stitches with some variation to keep it interesting. I’ve chosen a few by knitwear designers I have personally purchased patterns from and love. They keep making amazing designs, so if you like what you see here, make sure to go check out what else they have. I have also been working on Shannon’s Veronika Cardi all year long, and hope to have it finished soon! It’ll be just in time for Savannah’s winter, which starts at Christmas, apparently. I’ve seen this one floating around my Instagram feed for awhile, and it’s always a scroll-stopper. Drea is the queen of color mixing, but this one is (usually) done in a neutral, and that is my speed right now. I have bins full of brightly colored yarn, but all I wear these days is a carefully curated color palette and a lot of neutrals. (I’m going to have to do a lot of gift knitting.) 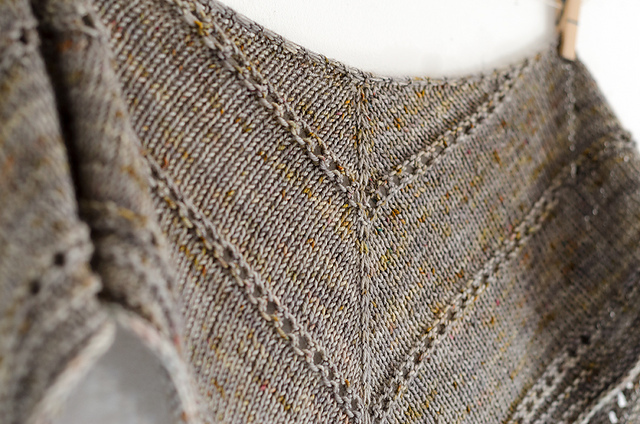 I do love the Find Your Fade Shawl, though, and currently have it on my needles (somewhere) in all the colors. I will knit this one one day. It completely delights my Art Deco loving heart. Just look at that pattern! 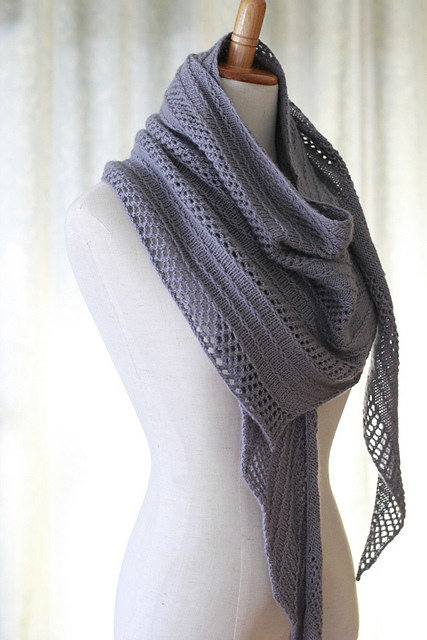 I also love Melanie’s Whiteout Shawl and Moonraker, but there are soooo many to choose from. It’s hard to pick even a few favorites. I have actually made and finished this one! Like, all the way! Although, this is not a picture of mine—the one that I knit was purple and blue, and was gifted to Jess. So, Jess, do you like the shape of this one? It is, apparently, called an asymmetrical sideways triangle. I’m partial to shapes like this, which are longer than they are wide, as opposed to a regular triangle shape or half moon shape. I want to be able to wrap and wrap and wrap without it being too bulky. This one turned out really nice, I thought, even though I made a ton of mistakes and didn’t quite stick to the pattern very well. 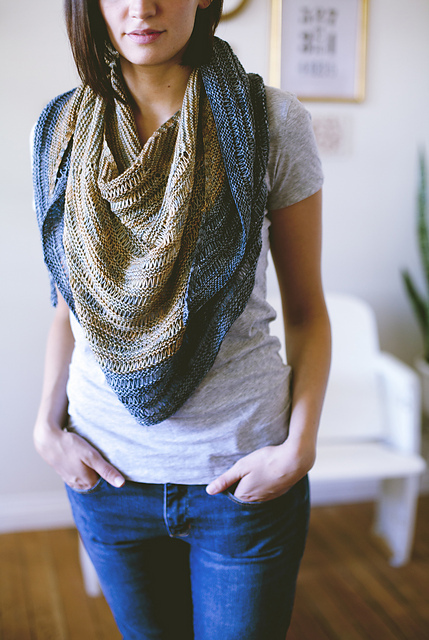 This is a great first shawl pattern. I knitted one of these out of some gorgeous yarn that was a blend of wool, silk, and cashmere. Every moment of knitting it was a dream, and then, when it was done and I tried it on, I realized that the color I had chosen was all wrong for me. Oh, well. It was exactly the right colors for one of my closest friends. The thing about this one, is that you can get away with only using one skein of yarn, but you end up with something more like a kerchief than a shawl. It will wrap around your neck, but not much else. You can continue the pattern, though, and keep adding yarn as long as you like. And, this pattern is free, so that’s a win. Melody Hoffman’s designs and aesthetic are just so lovely. Sylvia McFadden of Softsweaterknits. Just gorgeous. So, I hope that’s helpful, Jess (and others!) Don’t feel restricted to what I chose though—Ravelry has great search filters if you know what you’re looking for, like shape, weight, and yardage. Let me know what you decide to knit. Also, comment below if you have a favorite shawl pattern or designer! P.S. Of course, since I said that thing about not being crazy about triangular shawls, this is one I want to cast on right now after looking through everything. How fun is that!